Encourage healthy habits while keeping things fun and whimsical with this adorable CHARM IT! Banana-moji charm. Complete with brown enamel tops and bottoms, these three banana friends have yellow enamel bodies, each with a different emoji face... smile with tongue, blowing a kiss, and squinty smile. This delightful CHARM IT! 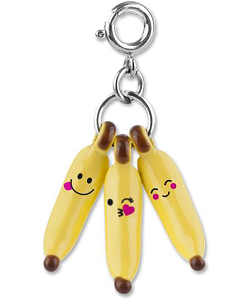 Banana-moji charm adds a serving of 3-dimensional personality to your charm bracelets with a simple snap of a clasp. Share the delight of special childhood treats with this CHARM IT! Retro Gumball Machine charm. This delectable Pink Lemonade charm features a clear cup full of refreshing pink "lemonade," green-striped straw, and a full lemon slice.